• medications are not completely used before their expiration date is reached. • potentially costly cleanup efforts. The Centers for Medicare & Medicaid Services (CMS) requires LTCFs to have policies and procedures for the storage and disposal of medications with a method of disposition that is consistent with applicable state and federal requirements, local ordinances, and standards of practice. However, medication disposal in LTCFs is complex and often confusing due to the competing objectives from multiple regulatory agencies that have taken steps to address pharmaceutical waste. Despite good intentions, the recommendations or regulations from these agencies have typically been uncoordinated and are often in conflict with one another, thereby increasing the potential for noncompliance. • Do not flush prescription drugs down the toilet or drain unless the label or accompanying patient information specifically instructs you to do so. 3. Put this mixture into a disposable container with a lid, such as an empty margarine tub, or a sealable bag. 4. Conceal or remove any personal information from Rx containers. 5. Place the sealed container with the mixture and the empty drug containers in the trash. The Occupational Safety and Health Administration (OSHA) may play a role in disposal, especially when sharps containers are involved (eg, Duragesic patches placed in sharps containers). The ASCP indicates that OSHA has advised that medications should not be put into sharps containers. OSHA also maintains a "hazardous drug" list, which dictates certain disposal methods and also requires Material Safety Data Sheets. State government agencies may maintain their own list of hazardous pharmaceuticals. Medication disposal systems such as carbon adsorbents are becoming available as a way for consumers to directly inactivate medications and reduce harm to the environment. These proprietary systems (eg, Rx Destroyer) allow the disposal of unwanted nonhazardous medications, including liquids, tablets, capsules, and transdermal patches, by placing products in a disposal pouch or other container and discarding directly in the trash. The use of deactivating and binding agents is intended to render the medication unusable and prevent both drug diversion and contamination of the environment. On October 9, 2014, the Secure and Responsible Drug Disposal Act of 2010 went into effect. The law authorizes the DEA to implement regulations establishing mail-back programs, take-back events, and the use of secured on-site disposal receptacles for the safe disposal of controlled substances with the intent to prevent serious injury/death as a result of unauthorized use of controlled substances, and to prevent the accumulation of unwanted controlled substances. The disposal options outlined in the final rule are voluntary. LTCFs may continue to use current disposal practices such as mail-back programs, take-back events, and flushing, provided they are legal within existing state and federal regulations. LTCFs and LTC provider pharmacies that opt to utilize these options must do so within the parameters of the rule. • LTCFs may dispose of pharmaceutical controlled substances on behalf of a person who resides in or has resided at the facility. • LTCFs may dispose of pharmaceutical controlled substances by depositing them into an authorized collection receptacle. • In LTCFs, an authorized retail pharmacy or hospital/clinic with an on-site pharmacy may install, manage, and maintain a collection receptacle. • Controlled substances and noncontrolled substances may be placed into receptacles. • Controlled substances disposed of by transferring into a collection receptacle should occur immediately, or not longer than three business days after discontinuation. • Discontinuation of use includes a permanent discontinuation as directed by the prescriber, as a result of the resident's transfer from the LTCF, or upon death of the resident. • One supervisor-level employee of the LTCF (eg, charge nurse) designated by the authorized collector may assist in changing the collection receptacle inner liner, provided it is done under the supervision of one employee of the authorized collector. • Upon removal, sealed inner liners may be stored at the LTCF for up to three business days in a securely locked, substantially constructed cabinet or a secured room with controlled access. The EPA proposal's revised regulations are intended to improve the management and disposal of hazardous waste pharmaceuticals and to address specific issues health care facilities face related to the management of unused/expired pharmaceuticals. A complete list of P-Listed and U-Listed hazardous waste can be found at www3.epa.gov/epawaste/hazard/wastetypes/listed.htm. • Unit-dose containers including medication packets, pill cups, blister packs, bottles, and vials holding up to one liter of liquid or 1,000 pills will be considered RCRA empty if the pharmaceuticals have been fully dispensed. • Syringes that held hazardous waste pharmaceuticals are also medical waste. Currently, these dual wastes must be managed to be in compliance with both RCRA and medical waste regulations. The EPA proposes to exclude syringes that contain residue of hazardous waste pharmaceuticals and instead, dispensed syringes can be disposed of as medical waste. • Health care facilities must inform employees who handle hazardous waste pharmaceuticals regarding the proper handling and disposal of these wastes. Training can be administered verbally or through written materials. • Instead of assigning containers for hazardous waste pharmaceuticals' specific waste codes, the EPA proposes to eliminate this requirement and instead allow health care facilities to simply mark containers "hazardous waste pharmaceuticals." Because of the complexity of medication disposal, increased scrutiny by regulatory agencies, and a rapidly changing environment, leadership at LTCFs are well advised to evaluate their current medication disposal processes. For the medication disposal program to be most effective and sustainable, a team approach is recommended. The consultant pharmacist can be a valuable resource in developing and evaluating all pharmaceutical services, including medication disposal. Contracting with a qualified medical waste disposal contractor is advisable. Operational procedures should be kept as simple as possible to help improve compliance. Increased education and training regarding unused pharmaceutical waste segregation and implementation best practice guidelines that are reinforced by training and self-audit programs is essential to any formalized waste stream management plan. 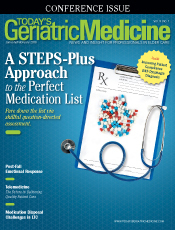 — Mark D. Coggins, PharmD, CGP, FASCP, is senior director of pharmacy services for skilled nursing centers operated by Diversicare in nine states, and is a director on the board of the American Society of Consultant Pharmacists. He was nationally recognized by the Commission for Certification in Geriatric Pharmacy with the 2010 Excellence in Geriatric Pharmacy Practice Award. 1. American Society of Consultant Pharmacists. Comments to Drug Enforcement Administration Re: DOCKET No. DEA-316. https://www.ascp.com/sites/default/files/ASCP-DEA-Disposal-0309.pdf. Published March 23, 2009. 3. Buxton HT, Kolpin DW. Pharmaceuticals, hormones, and other organic wastewater contaminants in U.S. streams. US Geological Survey. http://toxics.usgs.gov/pubs/FS-027-02/index.html. Updated August 4, 2015. SafeDisposal ofMedicines/ucm186187.htm. Updated November 3, 2015. 5. Fentanyl patch can be deadly to children. FDA website. http://www.fda.gov/ForConsumers/ConsumerUpdates/ucm300803.htm. Updated September 4, 2015. 6. Centers for Medicare & Medicaid Services. Nursing homes — clarification of guidance related to medication errors and pharmacy services. https://www.cms.gov/medicare/provider-enrollment-and-certification/surveycertificationgeninfo/downloads/survey-and-cert-letter-13-02.pdf. Published November 2, 2012. 7. Hospitals for a Healthy Environment. Managing pharmaceutical waste: a 10-step blueprint for health care facilities in the United States. http://www.hercenter.org/hazmat/tenstepblueprint.pdf. Updated August 2008. 9. Management standards for hazardous waste pharmaceuticals: a proposed rule by the Environmental Protection Agency on September 25, 2015. Federal Register website. https://www.federalregister.gov/articles/2015/09/25/2015-23167/management-standards-for-hazardous-waste-pharmaceuticals. Published September 25, 2015.